I tried out a new laptop. I’m actually very happy with my 2015 Thinkpad X1 Carbon. But as I slowly adopt more USB-C devices, I would like to consolidate on that as a charger format. USB-C laptops have been available for a while, but in the wake of meltdown, I saw no reason to purchase anything that wasn’t fixed. Finally, my gaming desktop is also in a satisfactory but aging state, and the possibility to replace it with a laptop and eGPU is enticing. So, three requirements. USB-C laptop. A Whiskey Lake CPU. Thunderbolt for an eGPU. The recent Razer Blade Stealth refresh checks all the boxes. Even though the calendar still says 2018 for a bit longer, I think this is the 2019 model, since there was already a 2018 refresh. Ordinarily I wouldn’t mention the ordering process, but... it was a process. First order was rejected by my credit card’s fraud system. Contact them, confirm it’s me. Make a new order. Payment is approved, but then Razer’s own fraud system rejects the order and reverses payment. Contact Razer, and apparently the solution in this case is to use paypal. Somehow that’s safer. Try that, trigger another fraud alert at paypal, but somehow manage to persevere and my laptop is on its way. Apparently there’s a problem with fraud in the gaming world. Who knew? If anyone asks why Amazon is eating the world, it’s because they sell me stuff when I try to buy it. It just so happens the same laptop is available through Amazon, but they supposedly only take returns on unopened laptops. I had some concerns about that. Foreshadowing. Body. The case is very well put together aluminum. It’s a fingerprint magnet, and curiously, fingerprints don’t really wipe off. The material seems rather porous, so finger oil seeps in and leaves a dark smudge. But then I found over time if you keep touching the same area and rubbing it in, it will take on a very even inky black look. I’ve never had a laptop that needed seasoning before, but I think the end result wasn’t that bad. Even worked to obscure the snake logo on the lid. Just know it’s not going to stay gray for long. There are two fans with intakes on the bottom that vent out the back. Positioned right about where it would rest on my legs. I thought this was a strange design, since it seemed easy to block. I didn’t have a problem, per se, but I also awkwardly propped it up by the edges when the fans came on due to (perhaps unjustified) concerns. Screen. Looked really sharp. I think 4K is maybe over the top for 13“, but it allows simple 2x scaling of 1080p. Keyboard. It’s a little shallow, but seemed alright. Not a Thinkpad keyboard, though, for sure. 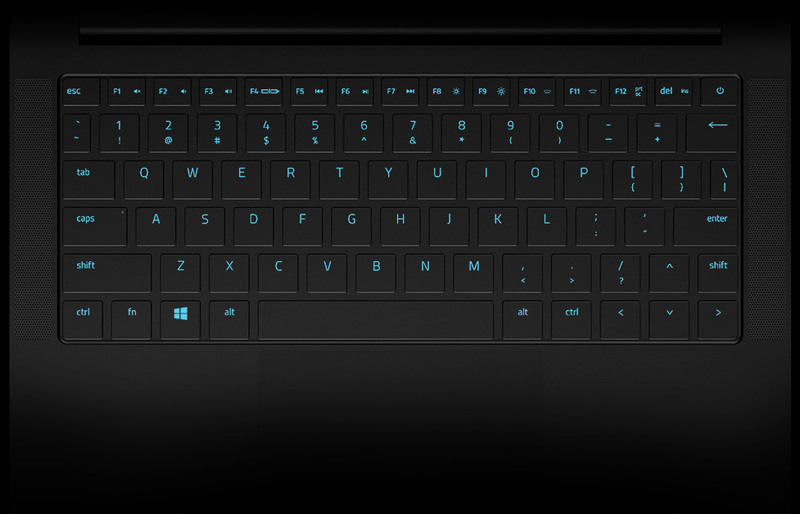 One detail I liked is that the arrow keys are all full size, instead of half chiclet arrangement. This does cut the shift key down. Also, some keys like the backslash are really narrow. Even stranger, all the number keys and brackets and such are labeled upside down. Apparently this is on purpose, though I found it really weird. Picture here. The keyboard backlight is user controlled RGB. You can set it to rotating rainbow, or solid one color, or a breathing pulsing effect. It may be superfluous, but I thought it was kind of fun and whimsical. Of note, the backlight controller is programmed via a Windows application (that requires an email login, which is crazy, you can’t change your keyboard backlight settings without an online service! ), but then works regardless of OS. Even in the BIOS, I had a keyboard kaleidoscope. CPU. I’m comparing this to a 2015 model now, but it’s fast. Nearly twice as fast single threaded, thank you very high turbo clocks. Plus four cores. I thought performance was dead, but four years later and we’re pushing close to four times faster. GPU. The onboard MX150 isn’t great, but probably adequate. I was able to briefly play Fallout 4 at 1080p with high settings. With some settings adjustment, it would have been fine. This does cause a bit of a ruckus with the fans. Ports. A sparing but decent collection. There’s USB-C and USB-A on the left, and Thunderbolt and USB-A on the right. So you can charge from either side, or plug in a mouse from either side, etc. I would have preferred both USB-C ports be Thunderbolt, but I think having USB-C on both sides is far more useful than two TB on the same side. Wifi. New Intel 9560. No weird Killer networking. Battery. Minimal testing, but I thought it was pretty good. Projecting from some light use, I think you could get 10 hours at a low brightness setting. But between the CPU and GPU, the equipment is here to consume power much faster than that. Noise. You have a laptop that needs to vent 40W of heat, it’s going to make some noise. In casual use, however, totally silent. Mechanically, anyway. My unit made an intermittent but frequent crackling noise from the speakers. This was not the infamous coil whine. There was a touch of that, but fairly innocuous. Nor was it regular speaker hiss from amplifying a silent signal. This was like a radio with a broken squelch. It would occur even with headphones plugged in, so you might be listening to music but the people around you will hear these strange noises coming from your laptop. Price. It’s expensive, but not more so than similarly equipped models. The 4K model, which is the only one I considered, only comes in an i7/16GB/512GB config. That’s overkill for me. Other vendors may let you save a few hundred dollars by stepping down to an i5/8GB/256GB config. A comparable X1 Carbon or XPS 13 were the same price, a Macbook Pro significantly more. I really wanted to like this laptop, and for a brief while I did. But the noise thing was too much. Sometimes you lose the VRM lottery and get a whiner, but this was much worse than that. This could only be called a defect. Sadly, it seems I’m not alone. I returned it for a refund. Unfortunately once the decision was made, I didn’t feel like committing to fully moving in and actually using it as I’d hoped. Limited to first impressions here. Some quirks, like the keyboard layout, were noticeable but also seemed adaptable given a bit of time. No reason why I wouldn’t keep it if only a twenty cent part had been better isolated. Just for funsies, I booted OpenBSD. Neither wifi nor graphics are supported yet, so that was a rather short lived experiment. On the bright side, I discovered our meltdown fix detection was subtly broken, that’s been fixed for the next intrepid Whiskey Lake user.